This week, on our weekly news roundup: Huawei becomes the world’s second biggest smartphone manufacturer – putting Apple into the 3rd place, the Xiaomi Mi Mix 3 gets revealed, and more! 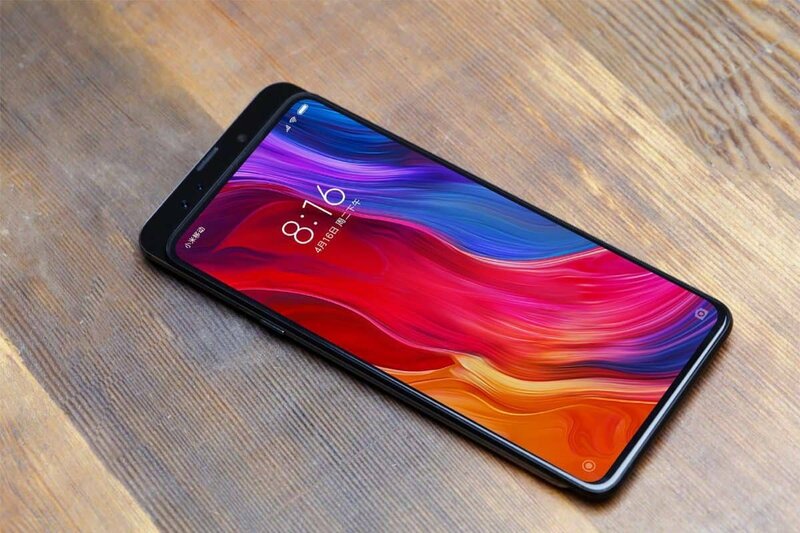 The Xiaomi Mi Mix 3 was recently seen on Weibo and is expected to launch somewhere in October – most likely during the end of it. Notch haters will be glad to see that there is no notch to be seen here. And despite the fact that the Mix 3 doesn’t have a notch, the bezels are still rather small. The small curve/empty space on the upper left part of the screen looks rather weird – but it’s something that you probably get used to. We currently don’t have any official information regarding the specs or the price of this device. However, we expect that it’ll come with 6/8 gigs of RAM, a Snapdragon 845 chipset, and Android Pie. Numerous reliable sources have mentioned that the Camera will be normally hidden and that we’ll be able to reveal it by sliding the back portion of the device upwards. That’s all we have for now. We’ll keep you updated if anything else comes up. So, stay tuned. The Xperia XZ3 was officially announced yesterday in the Sony IFA and it looks beautiful. As per usual with Sony devices, the XZ3 comes with a high price tag of $900 along with beefy specs, a 6-inch OLED display, and compared to previous Xperia devices – a rather new design. The lack of a notch is no surprise here. Sony never implemented it on its devices. Funny thing is how at first glance you’ll probably think that this is a Samsung device. It looks a bit like the Note 9 from upfront. But, if people like this, then we see nothing wrong with it. By taking a closer look at the XZ3, you’ll notice that it’s not only the notch that’s missing – but the 3.5mm audio jack as well. So, chances are that we’ll have to stick with adapters or Bluetooth headphones. Other than that, as you can see in the video above, it looks like Sony has brought a new UI which is based around gestures. Speaking of which, let us not forget to mention that the ZX3 comes with Android Pie by default. Overall, this is most definitely an impressive device. But, at $900 with only 4 gigs of RAM and a mediocre battery, it may be a bit of a disappointment for some people. Is the high-resolution OLED display enough to justify this price? Well, this is your call to make. So, what do you think about the Xperia XZ3? Like it? Don’t like it? Why? And why not? Let us know in the comments down below. Not too long ago, the Note 9 was officially revealed. One thing that particularly seemed interesting about it was its water carbon cooling system. However, it was never really explained in depth – not until now. 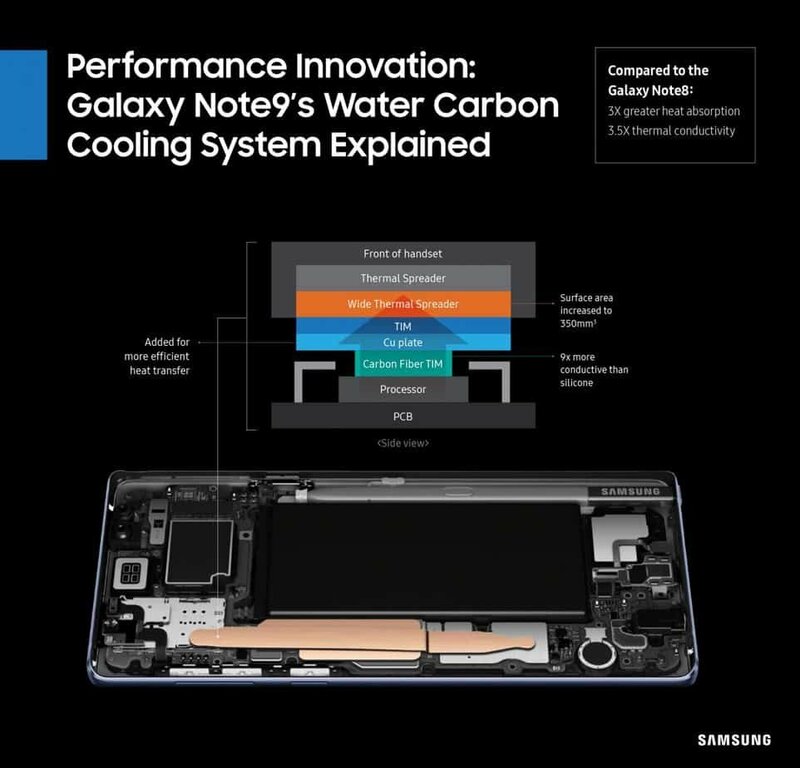 As you can see in the image above, Samsung sort of showcases the structure of the water carbon cooling system that the Note 9 utilizes. The carbon fiber acts as a thermal conductor – transfers the heat away from the CPU to the copper. As for the water, it basically turns into steam from the heat that the CPU produces, travels through the copper, then turns back into water, and the cycle continues. Now, a lot of confusion has occurred with this whole thing. Numerous geeks on the Internet have been digging into the innards of the Note 9 while trying to find water and carbon without being able to do it (sort of). As a result, lots of people claimed that this was false advertising from Samsung. So, it’s a good thing that Samsung took the initiative and decided to clear this up for us. It was a month ago where we saw Samsung releasing a series of videos called ‘Ingenious’. What they basically did, is that they compared Samsung devices to the iPhone X and showcased how they are superior to it in a rather satirical way. Well, now Huawei joins the battle with a more serious attitude – compared to Samsung that is. This is the photo that we got while hanging around Twitter. Judging from the watermark, we can assume that it was originally taken by The Verge. 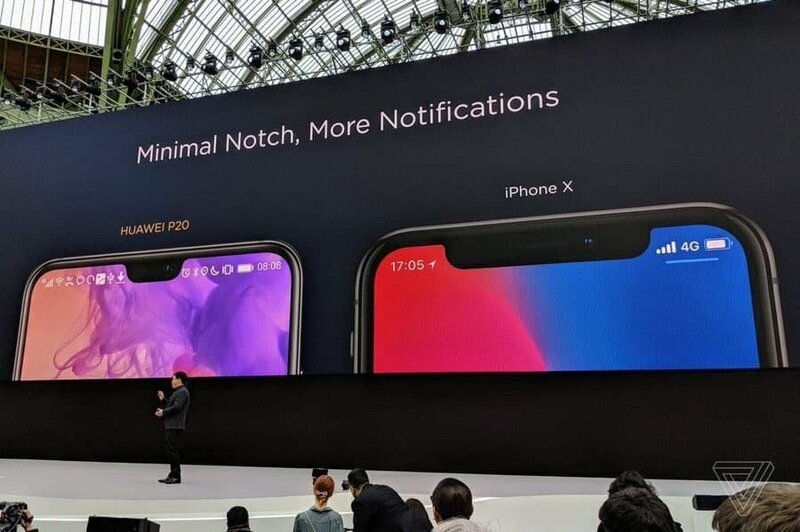 As you can see, Huawei clearly compares the notch of the P20 to that of the iPhone X and says that a smaller notch is better because it gives you more room for notifications. Apple fans responded to this by saying that not everyone likes to have so many notifications appearing at once. And that’s not all. 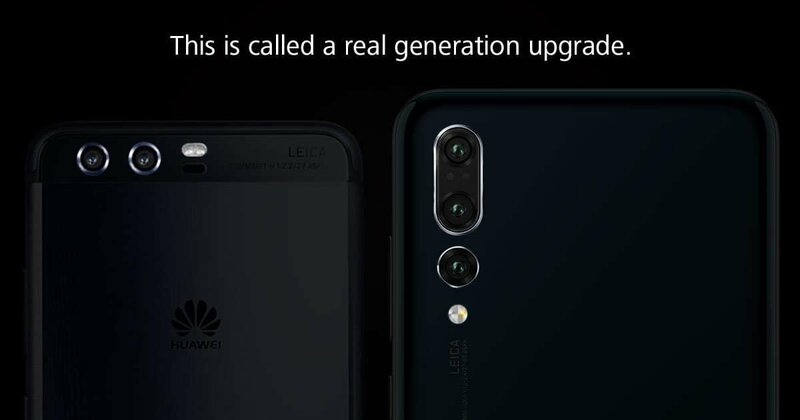 There back when the Note 9 was announced, Huawei uploaded a picture which talked about ‘real upgrades’. By looking at that image and the time where it was uploaded, we can sort of assume that Huawei was throwing the gauntlet on Samsung as well. At this point, it seems like the trio of Samsung, Apple, and Huawei, are all comparing their devices against each other to prove that they are the best. As for the notch, we understand how lots of people like it. But what we are really looking forward to, is the era where we’ll be able to completely eliminate bezels without using a notch or anything similar. It seems like Huawei is really not all talk – people love their smartphones. 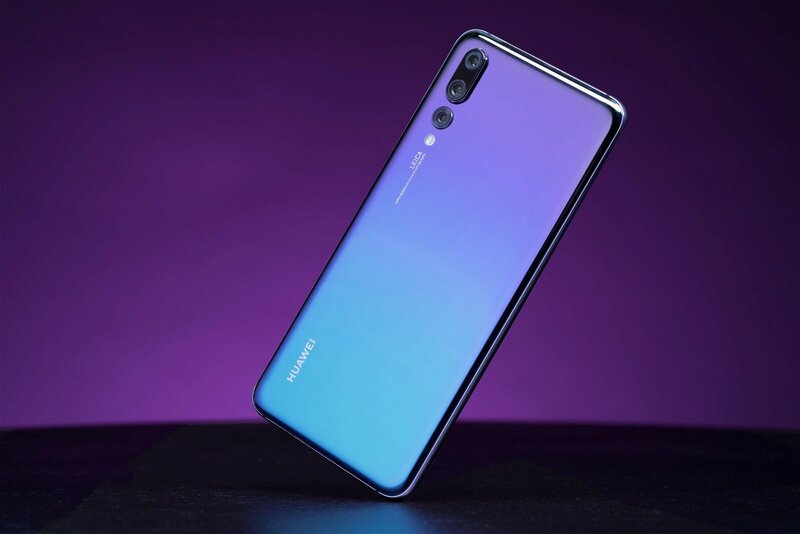 That became clear as day when Gartner’s researches showed that Huawei now has a bigger market share than Apple – which effectively makes it the world’s second-biggest smartphone manufacturer. At the moment, Samsung is the at the first place with a market share of 19.3%, Huawei follows behind with 13.3%, and Apple comes at the 3rd place with 11.9%. Both Apple and Samsung lost a little bit of ground this year. Huawei, on the other hand, has been gaining more and more market share. At this rate, who knows? Maybe we’ll live to watch Huawei at the top. There is no doubt that these 3 companies are ruling the smartphone market right now, but let’s not forget about Xiaomi. At the moment, when it comes to market share, it’s only 3% behind Apple. 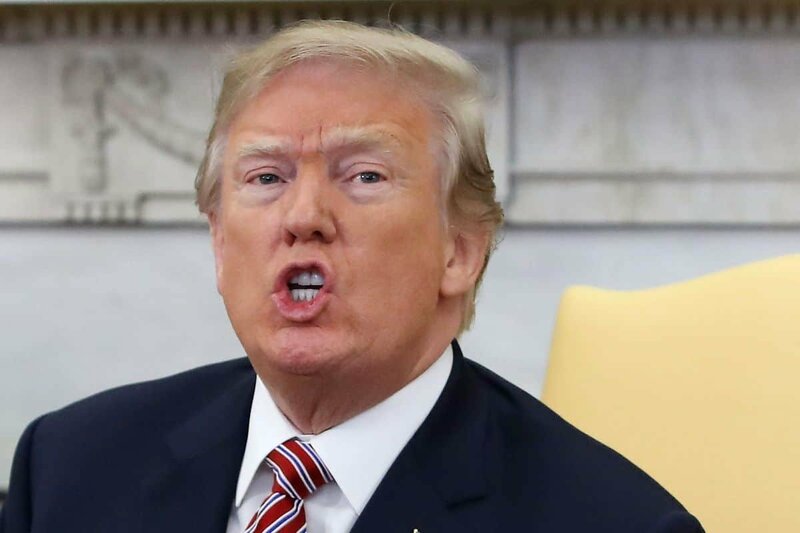 The president of the United States – Donald Trump, recently turned on Google. Apparently, he believes that Google is only showing fake news for him and that this is actually rigged against him and others as well. We don’t have anything else at the moment but we’ll keep you updated if anything else occurs. The Galaxy Note 9 potentially has the most powerful hardware that we’ve ever seen up to date. Anything from its cooling system to the camera is exceptional. However, it turns out that pictures under low lighting conditions are somehow still inferior to those of the Pixel 2 XL. Phone Arena performed the following experiment. 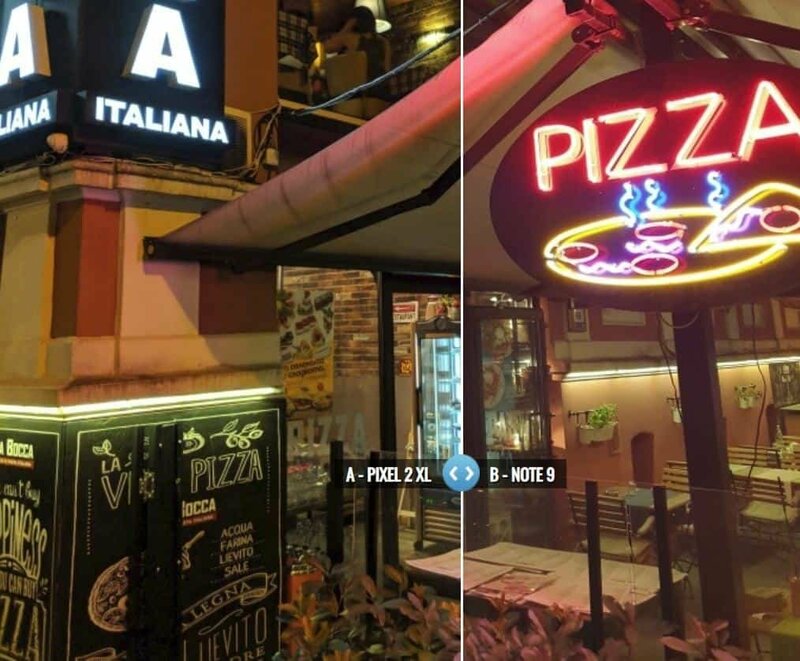 They took two pictures – one with the Note 9 and one with the Pixel 2 XL, and proceeded to upload them into a blind test. Meaning that readers had to pick the best looking picture without knowing which phone was used for them. After a while, the results came in. The vast majority of those who took part in this test – up to 97% – said that the Pixel 2 XL’s photos were better than those of the Note 9. Most people in the comment section are saying that this is a software related problem. So, after the appropriate updates, are we going to finally see the true potential of the Note 9’s camera? We truly don’t know. Still, let us not forget that the camera of the Note 9 is by no means bad. Despite losing to the Pixel 2XL, it’s still one of the best cameras that we’ve ever seen on a smartphone. Like what you see? Then don’t forget to follow us on Facebook and Twitter to receive the latest news, reviews, and more!